This year’s Irish Internet Association (IIA) Net Visionary Awards are now open for business. As always it’s 100% free to enter the Net Visionaries. This year’s event will again be held in the RDS in Dublin. The dot ie Net Visionary Awards 2016, one of the most hotly-contested awards for digital businesses in Ireland, are officially open for entries. In partnership with the IIA and IEDR, the awards recognise the best in digital Ireland across four areas of digital excellence: technology, entrepreneurship, digital marketing and innovation. Speaking at the launch of this year’s awards, David Curtin, Chief Executive of IEDR, said: “We are delighted to partner again with the IIA and the dot ie Net Visionary Awards 2016 will celebrate the Irish businesses that are leading the digital revolution in terms of entrepreneurship, innovation, marketing and web development and design. 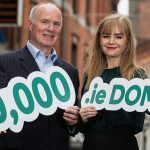 The dot ie Net Visionary Awards take place on October 7th at the RDS Concert Hall and are expected to attract a host of exciting newcomers that will join the industry’s IIA Hall of Fame, which was launched last year. Entries are open and free to enter on www.netvisionary.ie. If you’re interested in entering go here.